Most people are afraid of things that they are not familiar with, and they are willing to believe the frightening stories that they hear about those things. All too often the fears that we have can be confronted, if only we have the courage to do so. 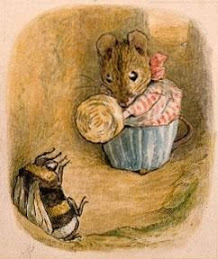 In today's picture book you will meet a little mouse girl who is afraid of a cat. but who still wants to see what it is like. High up in the clouds, “close to nowhere in particular,” is the land of Howodo. In this land, behind a big duck pond and in a small house, lives a curious and very sweet little girl mouse called Jenny. Jenny constantly asks her parents’ questions, and she delights them with her funny ways. Jenny’s mother tells Jenny all about Lorenzo, the cat who likes to eat “mouse on toast.” Not surprisingly, Jenny decides that she simply must go and see this cat for herself. Jenny is scared, but “since she always faced her fears and followed her curiosity,” Jenny sets off to find Lorenzo. As she walks through the countryside Jenny encounters some ducks and three piglets. They all warn her about Lorenzo and tell her to go back home before it is too late, but Jenny will not give up and on she goes, until she comes face to face with Lorenzo himself. The author of this delightful book builds up the suspense in a masterful way, making us worry on Jenny’s behalf, and making us think that perhaps Jenny should follow the pigs’ advice and go home. It turns out that Jenny has a secret weapon that, in the end, brings her adventure to a surprising close. Throughout the book the text is written in both prose and in verse. It is accompanied by Eve Tharlet’s deliciously lovely illustrations, which capture the emotions of the characters perfectly and give the tale a whimsical feel.